If you're a fan of country music, sooner or later you notice that sooner or later everyone takes a crack at it. Even people who are mostly associated with boozily swinging out the Great American Songbook at the Sands Hotel in Las Vegas. I speak, of course, of the Rat Pack, although pedants will correct me and explain that the Rat Pack was an older incarnation of this group, the storied Holmby Hills Rat Pack, based around Humphry Bogart and Lauren Bacall. The later one, the Frank Sinatra one, was called The Summit or The Clan. The Chairman of the Board barely had a nodding relationship with cowboy stories, although he did star in a laconic 1970 anti-Western with the astonishing name "Dirty Dingus Magee." However, during Sinatra's early and fertile years with the Tommy Dorsey Orchestra, he recorded "The Call of the Canyon," a clip-clopping cowboy song by Billy Hill, a former cowboy and prospector who wrote many of what might be called The Great American Cowboy Songbook, including "The Last Roundup" and "Empty Saddles." Hill's songs were unusually adaptable to jazz arrangements, and Dorsey gives the song a solid, laconic string arrangement that recalls the slow trot of a horse, as many cowboy songs do. Behind this he puts the horn section, offering mellow stings and then joining in give the chorus a jazzy punch. Sinatra swings his way through it in an enjoyably subdued way, as though he were recumbent by a campfire, his cowboy hat pulled down over his eyes, singing himself to sleep. Judy Garland was from the earlier Rat Pack, Boagrt's Rat pack, but it's worth mentioning her stripped-down version of "Shenandoah," an old fur trader song. Garland performed the song on her short-lived variety show, "The Judy Garland Show." Much of the song is performed with a simple harmonica and strummed guitar background, with Garland's quavering voice sounding haunted, as she often did. Eventually, strings, and then a deep gospel chorus joins in, surrounding the song like a melancholy blanket. Marilyn Monroe wasn't considered a core member of the Rat Pack, but instead a "mascot," along with a dozen or so people who occasionally joined in for Rat Pack outings. Monroe was reported to have her own room at Sinatra's place which she used for Kennedy trysts, though, so we're going to count her, because that's legendary. Also because Monroe's contribution to this list, "One Silver Dollar," is a genuinely terrific Western song, and should be better known. The song comes from "River of No Return," a 1954 film from a genre of Western movies that should probably be redubbed Pacific Northwestern movies, along with "North to Alaska" and "Emperor of the North," that tell of hardscrabble working class life in Northwestern boom town. Monroe plays a cabaret singer in one of these towns, and this is one of the songs she sings. It has about as minimal an arrangement as imaginable -- just a guitar -- but it highlights Monroe's singing voice, which seems to have forever been underestimated. She's a distinctive, breathy singer whose vibrato often tips over into a full warble, but she could really belt out a song. He she chews her way through a tale of the titular dollar, making its way west, being passed from one desperate man to another; the whole song is clearly a parallel for Monroe's character's life. The song has the sort of folk-Western quality you might hear in the Village at the time, but rarely made it into films. It's minor-key and Spanish sounding, and Monroe occasionally launches into an unearthly, genuinely spooky falsetto. It's no surprise to find Dean Martin on this list. He was long a fan of the Western, and used to disappear from his own parties to watch them. He would later star in several terrific Westerns, and his voice absorbed a slight twang later on. If anything, it's surprising Martin didn't record more cowboy songs. 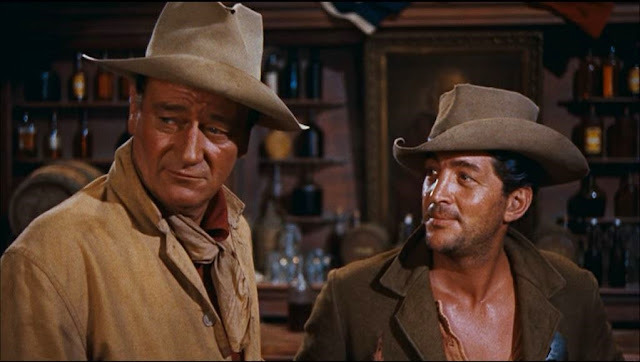 But "My Rifle, My Pony and Me" is terrific, coming from one of Martin's terrific Westerns, "Rio Bravo." The song is by Dimitri Tiomkin, a Russian of Jewish heritage who nonetheless proved to have a terrific ear for cowboy songs -- he also wrote the music for "High Noon" and "Gunfight at the OK Corral." The song isn't really era-appropriate. It has a Tin Pan Alley structure and Martin croons it, with backup voices sometimes offering the sort of vocal echo borrowed from college a cappella. But no matter -- it's a harmonica drenched ballad of a lonely cowboy dreaming a lonely dream being on the plains, far away from his love. Pop crooner Buddy Greco was also a mascot for the Rat Pack; one suspects it was mostly because he didn't share either the personality or the talent of the others. He had a cheerful voice and favored slightly tacky arrangements, which tended to be popular but received scant critical notice. All are on display on Greco's 1964 album, "Modern Sounds of Hank Williams." The title clearly comes from Ray Charles' "Modern Sounds in Country and Western Music," which came out two years earlier, and is an audacious borrow. Firstly, Charles was genuinely a fan of Country Western music, and his covers of classic country songs betrayed his genuine affection for the music; Greco just takes Williams' songs and sings them like a hotel crooner. Secondly, Charles was a world-class singer and arranger; this album is world-class nothing. However, it is entertaining, in the way a lot of hi fi lounge songs are, with an inappropriately rollicking horn section and a vocal band that sounds like light rockers The Connection had wandered over and joined in. If someone were to put out a belated entry into the Ultra Lounge collection of bachelor pad popular jazz that focused on covers of country songs, this would be the first song on the album. Sammy Davis Jr., a diminutive, one-eyed, Jewish black dude isn't the first person who comes to mind when thinking about country music, but he had some unexpected skills. Firstly, he was a superb gun twirler, a skill he learned from an equally unlikely source: Mel Torme. Secondly, he was an incredibly skilled vocal mimic, so much so that early in his career he was advised that he needed to develop his own style, as his voice could not be recognized from one song to the other. So when David decided to cover the Merle Travis and Tex Williams's novelty country classic "Smoke, Smoke, Smoke (That Cigarette)" in 1982, his version was good enough to chart on the country charts. He speak/sings it in a baritone drawl with a hint of a Texas accent. The arrangement is the sort of rollicking, guitar-driven country that was popular on 70's movie soundtracks, coupled with an occasional chorus of women singing backup, giving it an appealing pop flavor.